To solve a common comfort & energy problem, it just takes equal measures of innovation and determination. Beautiful but problematic. 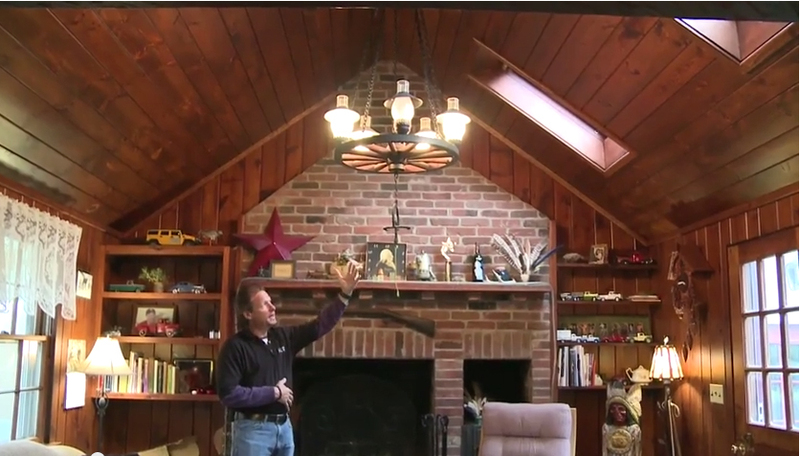 The cathedral ceiling in this older home is an important feature, but underperforming insulation made the room uncomfortable and expensive to heat and cool. The extremely cold weather that’s been buffeting most of the country has many homeowners thinking about insulation. More specifically, attention is focused on attic insulation, which plays such a major role in home energy performance. For contractors who specialize in improving energy efficiency, attic insulation and air-sealing upgrades are among the most commonly performed services. In most unfinished attics, it’s possible to add blow-in cellulose or fiberglass insulation directly over existing insulation, after the attic floor has been properly air-sealed. But what if there’s no attic in certain parts of your house? That’s the problem in rooms that have cathedral ceilings. A vaulted or cathedral ceiling is usually considered an attractive interior feature, dramatically enlarging a room and making space for desirable features like large picture windows, oversized fireplaces, ceiling fans and chandeliers. But there’s a major comfort and energy penalty that comes with a cathedral ceiling: too much air leakage and too little insulation. An unfinished attic allows room for a thick blanket of insulation (R-49 to R-60 is recommended for northern states). In contrast, a cathedral ceiling insulated with fiberglass batts (the most common insulation treatment) can only provide about R-30 of insulating value. The recessed lights that are installed in many cathedral ceilings exacerbate the problem by creating even colder areas on the ceiling. This happens because the can-shaped fixture housings extend into the rafter bays, interrupting the insulation coverage. Making matters worse, more heat is lost in winter as warm air escapes through openings and gaps in the fixture’s steel housing. Yes, this is why a room with a cathedral ceiling is likely to be chilly in wintertime and excessively hot in summer. In fact, the excessive amount of heat loss associated with cathedral ceilings explains why they factor strongly in ice dam formation following heavy winter snowfalls. Convection puts the warmest air inside the house up near the top of the ceiling, which causes snow to melt on upper sections of the roof. Melt water travels down the roof slope and refreezes along the colder eaves, eventually building up a frozen dam of ice that gives this cold weather calamity its name. A nifty solution. Larry Janesky of Dr. Energy Saver uses a long PVC pipe (against the chimney) to fill the cathedral ceiling’s rafter bays with dense-pack cellulose insulation. 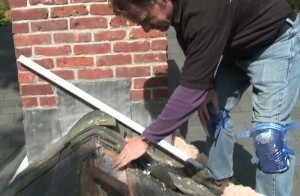 The pipe is inserted into each rafter bay through access openings made along the roof ridge. The openings are covered and shingled when the insulation retrofit is complete. There are some very expensive ways to stop cathedral ceilings from causing major comfort and energy problems. For example, you could remove the finished interior surface of the ceiling (usually gypsum board or wood paneling), install a continuous layer of rigid foam insulation beneath the rafters, and then install a new finished ceiling. It’s also possible to remove the roof shingles, install rigid foam insulation atop the roof sheathing, then add new sheathing and shingles. Wow, these are expensive fixes. For a faster, more-affordable solution to the cathedral ceiling problem, dense-pack cellulose insulation can be blown into the ceiling’s rafter bays through access points along the roof eaves or roof ridge. Fiberglass insulation allows air and moisture into ceiling cavities, necessitating a ventilation space directly between the roof sheathing and the batt insulation. But dense-pack cellulose doesn’t need this open airspace, because it effectively blocks air movement. So the entire ceiling cavity can be filled with cellulose, which has a higher R-value than fiberglass (R-3.8 vs. R-3.4). To summarize the benefits of this upgrade: higher R-value, dramatically improved air sealing, and affordable cost (especially when compared to the options mentioned above). I could explain the dense-pack retrofit process in detail, but Larry Janesky of Dr. Energy Saver does an excellent job in the video below. When you’ll watch it you’ll appreciate another benefit: No alteration or damage to the home interior (although you might consider replacing can lights in a cathedral ceiling with surface-mount versions). If you’ve got a cathedral ceiling problem in your house, Janesky’s energy-saving solution is worth considering. Tim and Joe – this is a tremendous! Great work guys! James: I suggest visiting the Dr. Energy Saver website (www.drenergysaver.com) and following the prompts to see if there’s a dealer in your area. Also, if there are recessed lights in your cathedral ceiling, I suggest converting them to surface-mount lights and air-sealing the openings for the cans to help slow convective heat loss.